Three months after its launch, the Parker Solar Probe just became the fastest man-made object in the solar system. On 29 October, the Parker Solar Probe reached within 42.6 million kilometres of the Sun, the closest any man-made object has been to the engine that powers the Solar System. Just a few days later, on 6 November, the spacecraft made its closest approach to the Sun, reaching a point in its current orbit known as the perihelion. The spacecraft was moving at a speed of 343,000 kilometres per hour, smashing the record for the fastest spacecraft. The previous record was held by the Juno spacecraft, on its final dive into Jupiter, at 266,000 kilometres per hour. The spacecraft is just getting started though. Over a series of orbits, it will become faster and faster, diving deeper into the corona in each circuit. At its first close approach, the probe was at a distance of 24 million kilometres from the Sun. Because of the intense radio emissions from the Sun, the spacecraft is expected to remain out of contact from the Earth for a few days. Autonomous systems on board are expected to keep the spacecraft up and running, during the time it is out of contact with home. The probe is on a mission to unlock the mysteries of the Solar corona. This is the part of the Sun that is still visible during a Solar eclipse. The high energy particles of the corona are so hot, that the temperatures are higher than even the surface of the Sun. The spacecraft will be exposed to temperatures in excess of one million degrees Celsius. Protecting the sensitive instruments on board is a 4.5 inch thick, and 2.4-metre wide heat shield. The shield is made up of a carbon composite foam sandwiched between two carbon plates. The Sun-facing side of the shield has a coating of white ceramic paint, to reflect away as much sunlight as possible. The instruments on board will remain at a relatively cool 30 degrees Celsius, thanks to the shield. There are some instruments that do peek out around the shield though, such as antennas and a particle collecting Faraday cup. These are necessary to make the observations. Also peeking out from behind the shield, at an angle, are the solar panels. Only a small portion of the solar panels are exposed to the Sun, and they are cooled internally by water and a radiator. Sensors along the panels ensure that the panels are not overexposed to the Sun, and re-orient the spacecraft automatically if the panels are likely to be damaged. While scientists do know that the corona is much hotter than the surface of the Sun, they do not know exactly why this is the case. One of the fundamental mysteries that the Parker Solar Probe hopes to solve, is to understand exactly why the corona gets so hot. The probe will also study the phenomenon of solar wind – a stream of high energy particles that move all the way to the orbit of Neptune. These particles cause the aurorae on Earth when they react with the atmosphere. Observations by the previous spacecraft have indicated two types of solar wind – there is a slow stream and a fast stream. Mariner 2 identified the source of the fast stream as relatively cooler regions on the surface of the Sun, known as coronal holes, not to be confused with sunspots. The source of the particles in the slow stream is not yet known. This is another mystery of the corona that the Parker Solar Probe hopes to unlock. The problem with studying Solar Wind so far has been that most of the observations have been taken from instruments on the Earth or close to the Earth. The Parker Solar Probe repeatedly diving into the corona itself will allow scientists to get up close and personal with the Sun, and better study it. The Parker Solar Probe is the first NASA spacecraft to be named after a living person. 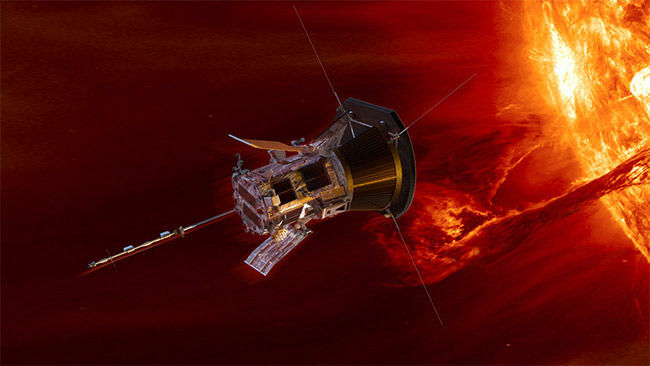 Initially, the spacecraft was called the Solar Probe Plus but was renamed to honour Parker. Parker developed a theory in 1958, that predicted the existence of Solar Wind. According to the theory, there is so much heat in the corona, that the high energy particles escape from the immense gravity of the Sun, and flow outwards into the Solar System. This solar wind affects all the planets in the Solar System, which is why scientists want to better understand it. The Parker Solar Probe is humanity’s first mission to touch a star.